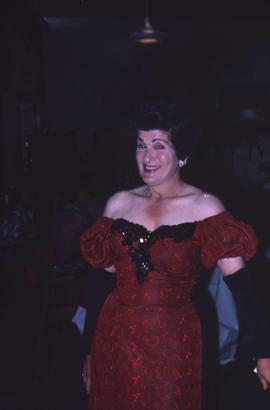 Colour Kodachrome II 35mm slide depicts an unknown woman wearing a red and black sequin off-the-shoulder dress with black gloves and black feathers in her hair. Colour Ektachrome 35mm slide depicts three unknown women sitting at a table, with two of the women looking at the camera and the third woman looking down. There is a fourth person on the left side of the image but only their hand is visible. Colour Kodachrome 35mm slide depicts a two unknown women and an unknown man and the man is dressed as a cowboy and one of the women is wearing her white glasses upside down. Colour Kodachrome 35mm slide depicts an unknown woman wearing a red top and a grey hat smiling at the camera. Colour Kodachrome 35mm slide depicts an unknown man and woman sitting down and posing for the camera. 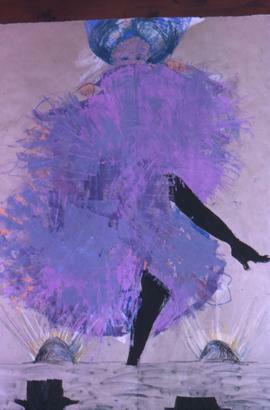 The image is taken from the chest up and only half of the woman is visible to the camera.